Personal Line of Credit (PLOC)** 9.25% 18.00% $25 or 2.50% of the total balance, whichever is greater. For certificate secured loans***, the APR is set at 3% above the certificate's earning rate. For savings secured loans****, the APR is set at 3% above the secured savings account's earning rate. * APR (Low) indicates the lowest annual percentage rate you may qualify for on the loan. The loan interest rates shown in the table are reflective of a range of rates available. All loans are subject to approval. You may qualify for the lowest rates published depending upon your credit qualification, the amount financed, receiving a 0.25% APR reduction by maintaining an automatic loan payment each month and 0.25% APR reduction for qualifying for the Premier Member Merits category. The following examples illustrate the expected monthly loan payments for members who qualify for the prime rate, premier member merit status and enroll in automatic monthly payments. A $5,000 All-purpose (Signature) loan with 8.24% APR for 36 months has a monthly payment of $157.25. A $5,000 All-purpose (Signature) loan with 13.49% APR for 60 months has a monthly payment of $115.00. If you delete your automatic payment request or the credit union terminates your automatic payment request due to insufficient available funds, this interest rate may be increased by one-quarter of one percent (0.25%) for the remaining term of the loan. This rate change will be reflected on your credit union statement. ** Personal line of credit is not eligible for the Member Merits or automatic payment decrease in APR. The Periodic Rate and corresponding Annual Percentage Rate for the Personal Line of Credit loan is calculated by adding a graduated margin (the margin is based on a risk based pricing tier) to the month end Prime Rate for the previous calendar month as published by the Federal Reserve. The Annual Percentage Rate will never be more than 18% or the maximum rate allowed by applicable law. *** Advances secured by credit union certificates are made at a rate based upon the earning rate of the certificate. The Periodic Rate and the Annual Percentage Rate are set at the time of the advance that is the earning rate on the pledged certificate, plus 3%. For example, if you pledge an account earning 5.00% your Periodic Rate would be .021918% and your Annual Percentage Rate would be 8.00%. The actual rate will be disclosed on the Disbursement Receipt at the time of the advance. The credit union may offer other rates in the future. We may be able to match rates from other lenders. All loans are subject to approval. 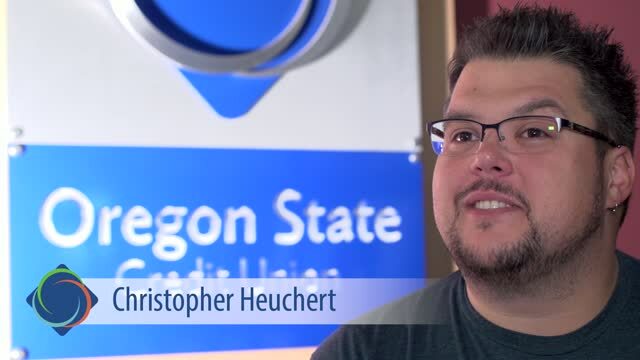 In this video members explain why Oregon State Credit Union is the right choice and a good example of the credit union difference.